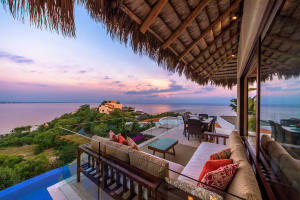 Real Del Mar is an exclusive oceanfront community built directly on the incredible Playa Piedra Blanca in La Cruz de Huanacaxtle, Nayarit and offers some of the most desirable real estate. Truly the essence of luxurious and private oceanfront living, Real del Mar is built on 30 acres of lush, tropical jungle overlooking the entire Bay of Banderas. This development features 59 spectacular ocean view homes nestled into a hill bordering a white sand beach and is widely considered some of the most sought after real estate on the nayarit coast. The community offers resident a private beach club and some of the whitest sand on the Bay of Banderas. The restaurant is serviced by La Cruz gourmet restaurant Frascati offering its members frsh delights, friendly service and an upscale tropical ambiance. Real Del Mar has a mesmerizing ambience and offers its residents a close proximity to the airport but enough distance from the crowds to maintain privacy and tranquility.